Someone put this great video together using the website access log visualizer Logstalgia. You can see visitors to the left and the server to the right. Once again, a high-traffic website access log visualization, this time using another tool, Gource (which we’ll show more from later). Interesting website access log visualization using glTail. Each circle is an HTTP request, and the size of the circle shows the size of the request. A pretty cool visualization, mapping the location of the site’s visitors as the hours change. A brief look at Twitter’s firehose anno 2009. One more Twitter visualization, this time showing tag clouds bubbling up in realtime. Location streams from Foursquare, Gowalla, Twitter, etc, during SXSW in Austin, Texas this year. Created using Processing and OpenStreetMap. While we’re on the subject of social networks, why not have look at the activity on Facebook? This is a pretty interesting visualization, showing different kinds of Facebook activities mapped onto a model of the planet. Apache is the most widely-used web server on the Internet. This is a visualization of its development history using a tool called Code Swarm. Another fundamental part of the Web today is Linux, highly popular in web servers. Here’s the code swarm showing it’s development from the start (1991) until 2008. Note the vast difference in activity over time. At the start, there’s just Linus Torvalds, but just look at the activity during the later part of the video. Because it’s just plain pretty, we couldn’t help but include one more visualization of the Linux kernel development, this time using Gource. We’ve already mentioned Gource (which is, as we’re sure you’ve figured out, a software version control visualization tool). Here’s another cool video showing projects like Drupal, Ruby on Rails, PostgreSQL, etc. Not entirely sure what’s being shown here other than that it’s DNS-related. Again, using glTail. Another visualization tool strutting its stuff, this time SkyRails, showing activity in a network with 300 nodes. As a relaxing ending to this little collection, we thought it would be nice with a visualization of what’s making most of this possible: the Internet. This is a slideshow, but it’s worth looking through. We hope you enjoyed these videos. And for those of you in the United States, happy Thanksgiving! I saw a presentation somewhere where they took one of those log analyzers and used to graph crimes in various parts of the city. It was very interesting to see emerging patterns as times goes on. I’d like to add this one. 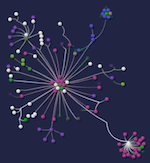 It’s not an animation, it’s however quite a beautiful image visualizing millions of Facebook relationships. @Janek: Agreed, that’s a beautiful visualization (quite amazing, actually). Imagine if they also made it real time (or an approximation thereof) and added the communication flow on top of it (for example chats and other messages). Great blog, keeping me from working on articles. Good to see more people writing about this subject.